Ramaz Wins 3rd Place At The CIJE- Tech Hackathon! Mazal Tov! 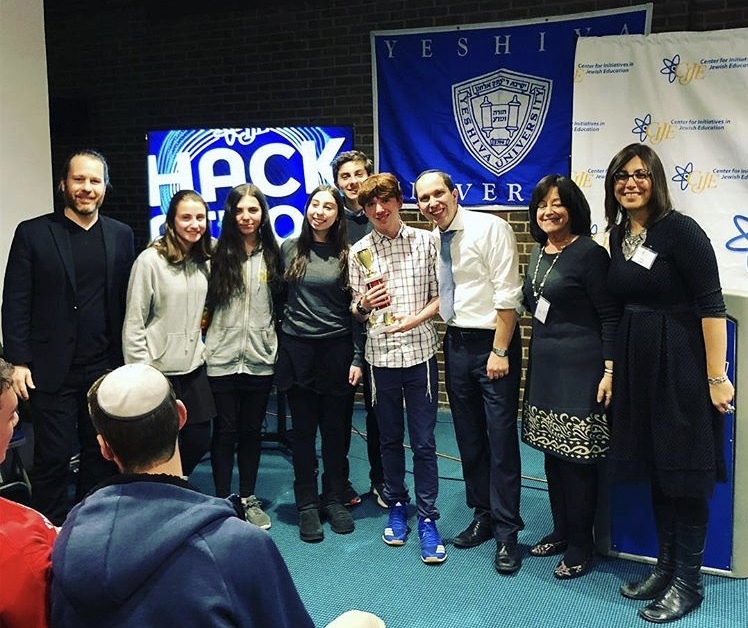 Last week, five students- Sydney E. '22, Jonathan S. '21, Finley H. '22, Levi L.'21, and I, Sally N. '22 - supervised by Dr. Nironi, went to Yeshiva University to compete in the first ever CIJE-Tech (Center for Initiatives in Jewish Education) Hackathon. The prompt was aimed at helping make the lives of the elderly currently residing at Jewish assisted living facilities easier. We received four people's medical situations after listening to two heads of facilities talk about the project, ranging from neglecting to take their medication to not being able to make friends due to sight impairments. All 12 schools present were given 4 hours to team together and use their skills to make a device connected to a NodeMCU controller to help out with a specific scenario. A NodeMCU controller is a WiFi-connected micro-controller that doesn't need any wires to receive information from the code written in the language C from the computer. The Ramaz team decided to help a woman who felt that she was at a social disadvantage because of her visual impairments, as she reports that other residents look down on her because she requires a lot of patience to be around. We decided to expand upon a comment one of the presenters made, that she asked her for a Hebrew Braille pen-pal to befriend. We took this comment and materialized it; we decided on making a "Braille-Box," which receives words in both Hebrew and English from a website we made, and converts it into Braille, raising up to 6 pins attached to servos designed to represent the raised dots in Braille. Throughout the 4 hours, everyone vigorously worked on both the hardware and the software, fixing problems wherever they came up. Levi L. and Sydney E. mostly worked on the code, while Finley H., Jonathan S., and I focused on hardware. We worked on the project until the very last minute, and the box and its complementary code is reflective of this. After presentations from all the schools, it was finally time for the announcements for the winners. Ramaz came in third place, behind MTA in second and Frisch in first. This event was educational and fun, and it increased our understanding of how both hardware and software work.